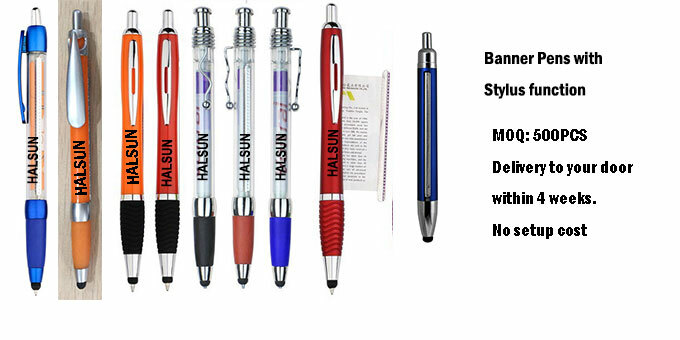 Banner Stylus Pen, Custom Scroll Stylus Pens/Flag Stylus Pens,HSBANNERSTYLUS-3M,Free Shipping & No Setup Charges,4 weeks to your door! Customized 3 in 1 banner stylus pens. Pull Out full color offset printed Banner Message Pens with stylus. No setup charges. Free shipping to USA, West Euro, Australia. For clients from Africa, South America,East Euro, Mid East and other areas, please order here. Customized 3 in 1 banner stylus Pens. Pull Out Banner Message Pens with Stylus. Free shipping to USA, West Euro, Australia. 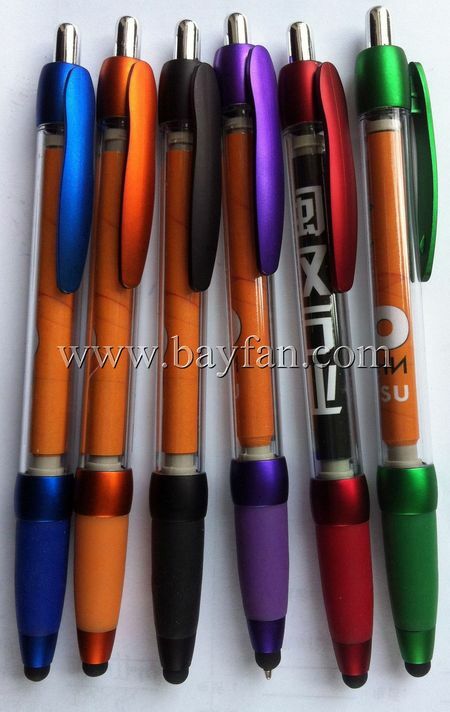 We've been professional Chinese manufacturer and direct seller of banner stylus pens for years. We've helped many companies to enhance their promotional program, distinguishing political candidates by giving away this unique and useful banner stylus to public. Supplement your banner stylus displays with the perfect trade show promotional giveaway. 3 in 1 promotional Message stylus pens combo: ballpoint Pen, capacitive touchscreen stylus, and full coloroffset pull out retractable banner printed 2 sides. 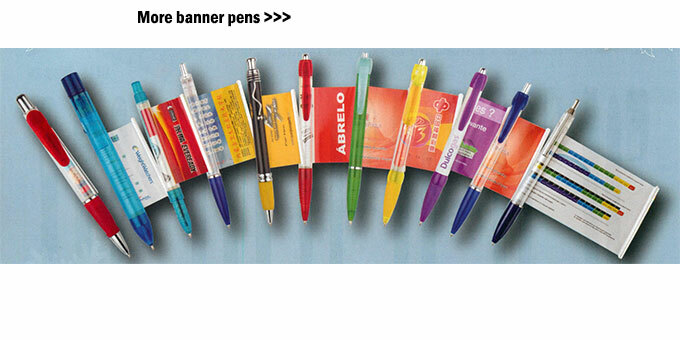 Our innovative retractable banner stylus message pens leave a long-lasting impression on potential customers. Print your logo, company information and special offers on our personalized banner message stylus pens! With banner stylus from bayfan, your customers will take your brand with them everywhere they go. Display your picture message inside a banner stylus! An intergrated black soft stylus on the tip of pen for capacitive touch screen mobile phones, iphone, ipad, android tablets. Force Majeure, include but not limited to flood, fire, truck/air plane crash. Unexpected express delivery company delay. Unable to delivery goods due to absent of receiver. ? ? ?? ? ?? ? ?? ? ?? ? ?? ? ?? ? ?? ? ?? ? ?? ? ?? ? ?? ? ?? ? ?? ? ?? ? ?? ? ?? ? ?? ? ?? ? ?? ? ?? ? ?? ? ?? ? ?? ? ?? ? ?? ? ?? ? ?? ? ?? ? ?? ? ? 1. Extra Barrel Color: ? Order Extra barrel color here ? By default, each order come with one barrel color, which you can choose from availabe colors or other common colors. But if you want two color assorted in your order, if you split into two orders, it will cost you more. So we TideGifts set and selective zone of "Extra Barrel Color". If you want two color assorted, you just need to selet " 1 extra barrel color". 2. Extra artwork setup charges: ? Click to order your extra artwork setup charges here ? By default, each order comes with 1 full color offset printed artwork with free of charge. But, sometimes, you want two artworks in your order, if you split it into two orders, it will cost you more. Now at TideGfits, you just need to choose "1 extra artwork setup". 3. Logo imprint on barrel addon service. Silk Printed / Pad Imprinted logo on plastic barrel pen: ? Click to order Logo imprint on barrel addon service here ? By default, the banner stylus comes with a retratable full color offset printed banner. Normally that demostration of advertising ability is very good. But if you want extra advertising effect even the banner stylus are closed, TideGifts can imprint extra logo on the barrel with silk imprint or pad imprint method. Logo size up to 60*9MM max. You just need to email TideGifts your logo along with artwork. 4. Artwork Design Service Addons: ? Click to order your Artwork Design Service here ? By default, artworks for 38*100MM banner are supplied by you to demostrate best effect you desired. Well, in case you want Bayfan to design your artwork, you just need to send Bayfan your requirements and pictures. Our desintgers will work according to your requirements. And Bayfan send you finished artwork for approval. Tips: Use Add to Cart function and check out after all items are added to our shopping cart instead of paypal express check out will save you time, if you are using above addon service to enhence your normal order. ? ? ?? ? ?? ? ?? ? ?? ? ?? ? ?? ? ?? ? ?? ? ?? ? ?? ? ?? ? ?? ? ?? ? ?? ? ?? ? ?? ? ?? ? ?? ? ?? ? ?? ? ?? ? ?? ? ?? ? ?? ? ?? ? ?? ? ? ?